This large forest tapestry is the scene from the Jagaloon Tapestries, a series of tapestries at the castle at Wawel, Krakow, Poland. They were commissioned by the King of Poland and woven in Flanders in the mid 16th century. Here we see the remarkable forest of Poland where The Forest, Iris, Woody, Timberland, Underwood, Wooden Hills, Woodland tapestries are taken from. The forest is a deep grey green with hints of blue coming from the river to create a scene that is unique and shows the color palette of the forest in a morning light. The sheer variety of detail of each type of leaf and foliage and tree is a remarkable achievement, and the leaves of the vines climbing the trees provide a fantasy like environment for the viewer's eye to wander. 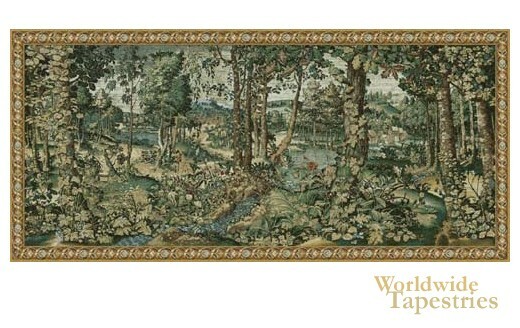 This large landscape or verdure tapestry "Royal Hunting Woods" is backed with lining and a tunnel for easy hanging. Dimensions: W 88" x H 41"